As per the current outlook of the bearish market, passive funds are snatching the limelight. After news of loan defaults by IL&FS broke, the Sensex and Nifty have dropped significantly from their highs. This scenario is also coupled with rising crude oil prices and the depreciating rupee. With market continuing to remain volatile, passive funds are snatching the limelight. Let’s do a 3 point analysis on whether it’s time to switch from active funds to passive funds. One, What is the difference between the two? Active funds are designed to try and outperform the market. Outperformance means the fund's own performance is better than a benchmark index, say the Sensex and Nifty. The performance of active funds is driven by portfolio construction, which differs from the benchmark, and which is driven by fund manager conviction is some stocks more than others. However, funds do not promise or guarantee the continued and regular out-performance. Passive funds, on the other hand, are maintained to give the market return and no better or worse than that. So, these funds are ideal for first-time investors who would like to take equity exposure. Two, increasing inflows to passive funds. Most managers in active funds fail to beat the benchmark and thus over the last few years passive funds have been witnessing increased inflows. Passive funds have received a boost as the govt has provided an option to invest via EPFO in ETFs. Three, the difference in expense ratio. Active funds charge a higher amount to maintain the portfolio. Whereas, passive funds have lower expense ratio. Studies show that active funds are no better than the passive funds in the long run. According to experts, the only difference is that active funds drain more money from the investor by giving no better than the average market returns. In conclusion, investing in passive funds can save the investor about one point five percent as the expense ratio in passive funds is lower and when this number is compounded it saves a lot more. 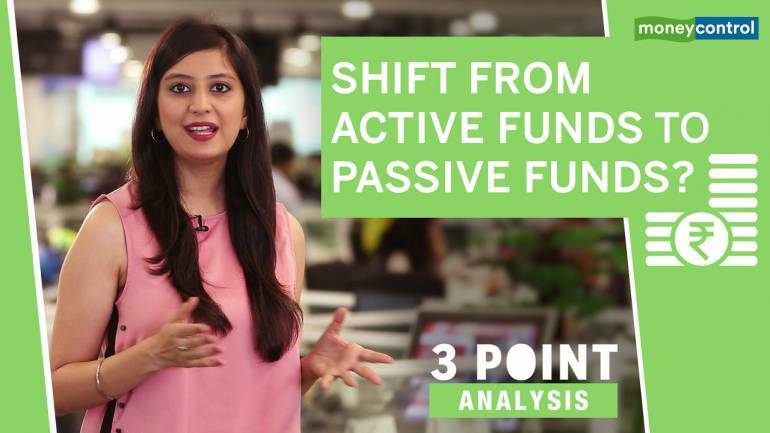 3 Point Analysis | Time to shift from active funds to passive funds?